Home to an impressive gothic cathedral, a collection of underground caves and a hilltop castle that dates back to the 1300’s, Mallorca’s capital city of Palma has a lot to offer. Whether you’re backpacking around the country, on a family vacation or enjoying a romantic break, Palma’s many attractions will delight the worldliest traveller. From day tripping to the white sand beach of Formentor, to uncovering Palma’s delicious cuisine in a tapas tasting class, there’s always something exciting to do here for everybody. When it comes to getting around Palma de Mallorca, it couldn’t be more simple thanks to the efficient public transport system and hop-on-hop-off buses. Making your way from one attraction to the next has never been easier, and once you’re ready to venture out of the city limits, there’s plenty of coach tours, and boat rides to transport you to the surrounding area. To save you time we’ve price-compared tours in Palma de Mallorca and have compiled a list of our favourite trips in and around the city, complete with our top tips, customer reviews, and instructions on how to get there. Explore Palma de Mallorca at your own pace by jumping on board the hop-on hop-off bus and alighting at any of the 16 stops around the city. Fly past the Catedral El Seo, the Alumndaina Palace and the beaches of Palma, jumping off wherever you fancy! Visit the Castell de Bellver and wander around the medieval gardens and parks or stop for lunch in the Plaza Espana. Audio guide in multiple languages. The Mallorca Hop-on Hop-off City Bus has earned over 615 reviews and a 4-star rating on TripAdvisor. Travellers agree that the bus is a terrific way to explore the city and hop from sight to sight. Other users noted that the buses were frequent and efficient. Great for first time visitors in the city. Perfect for those wanting quick and easy transport. Ideal to visit multiple locations. An eight our tour that takes you out of Palma and explores some of Mallorca’s best bays, beaches and coastal roads. The perfect way to see some of the most beautiful parts of Mallorca while enjoying safe, easy and affordable transport. It’s a great way to learn about the islands history through your knowledgeable tour guide. A day trip that’s perfect for friends and family alike. Visit Formentor Beach and the bay of Puerto Pollensa on this day trip. Explore Puerto Pollensa bay and go swimming off Formentor Beach. Enjoy a 30 minute boat ride offering spectacular coastal views. Transporation on an air-conditioned coach. 25- minute boat trip (available May - October). Cap de Formentor, Mallorca, has earned over 2,396 reviews and a 4.5-star rating on TripAdvisor. Travellers noted that this tour provided wonderful scenery and beautiful beaches. Others noted that the guides were well organised and efficient. Great for those wanting to explore the surrounding area. Fun trip for adventurous friends. This tour is the perfect way to uncover the Old Town of Palma Mallorca with a guide who knows the towns history, culture and best secrets. The Old Town was the epicenter of Mallorca back in the day and today remains traditional to the islands way of life. It was here that the island did most of its trade, it was the economic heart of the island but less so today. 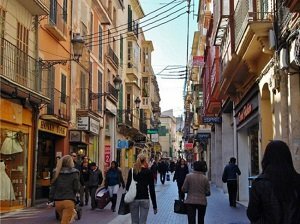 Discover the Old Town of Palma de Mallorca on foot with a knowledgeable, professional and passionate guide. Explore the towns unique streets, stopping in the plazas, outside city palaces and modernist buildings. Visit the Consolat de Mar and the impressive Es Baluard Museum. Guided tour of Palma's Old Town. English speaking guide (French, Russian and German speakers available). The Guided Walking Tour of Mallorca's Old Town has earned over 230 reviews and a 4.5-star rating on TripAdvisor. Travellers noted that this tour was good value for money and super informative. Others noted that the guides provided a great history lesson on the Old Town. It’s a great way to explore the town from a different perspective and burn some calories while you’re at it! Quad biking is a safe and exhilarating excursion suitable for friends and couples alike. Follow your guide to enjoy a whirlwind ride through some of Mallorca’s finest countryside. If you’re after an adrenaline fix or a thrilling day out then this is the tour for you as quad bikes offer an adrenaline pumped adventure. Explore Mallorca from the back of a quad bike as you ride through the city, countryside and nearby canyons. You’ll visit nearby sights including Ballermann 6 and Playa de Palma. Drive to the cliffs in Delta of Majoris and up the speed to explore the hinterland and dirt roads. Head away from the tourist traps and ride off-the-beaten-tracks to discover some of Mallorca’s most beautiful landscape made up of canyons, gorges and picturesque coastline. Three hour moped hire with helmet. 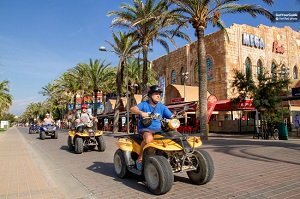 The Majorca: 3-Hour Guided Quad Bike Tour has earned 33 reviews and a 4.5-star rating on Get Your Guide. Travellers noted that this tour provided an unforgettable experience. Others noted that tour allowed you to "experience Mallorca's beauty in an adventerous way". Great if you want to explore the island. A combination of a sightseeing tour and a culinary tour. Enjoy a walking tour around the Old Town stopping at some of the cities famous landmarks before heading to three local restaurants to sample the tapas. Admire the Old Town Cathedral, the Almudaina Palace and the Es Baluard Fortress in the evening light. 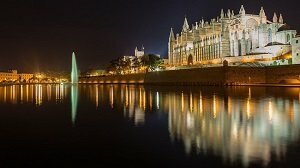 Learn about the imposing Palma Cathedral and its history in the town. Three pichos at the first bar. Selction of tapas dishes at the second bar. The Palma: Culinary Tapas Tour of the Old Town has earned 26 reviews and a 5-star rating on Get Your Guide. Travellers noted that this tour offered a super evening tasting Palma's finest tapas. Others noted that tour guide was not only full of knowledge on the tapas, but also the history of the Old Town. Culture vultures will enjoy exploring the town. Perfect for friends and couples. An eight hour guided tour of Mallorca and it’s surrounding coastline, beaches and countryside that makes use of coaches, boats, trams and trains. It’s a great way to enjoy epic views of the island from aboard a boat at sea. A perfect way to visit the Tramuntana Mountains, a stunning mountain range listed as a UNESCO World Heritage Site and located along the north-west coast. Explore Mallorca’s finest countryside and landscapes on this eight hour guided tour. Hop aboard the coach first thing in the morning and depart Palma de Mallorca for the surrounding landscape. 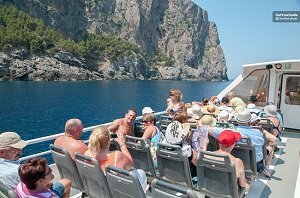 Enjoy epic views of the island from both bus and boat as the tour makes its way along the Tramuntana Mountains and out to sea on a sail boat. Return bus journey with English, Spanish and German speaking guide. The Scenic Full-Day Tour of Mallorca has earned over 359 reviews and a 4.4-star rating on Get Your Guide. Travellers noted that this tour explores some of the coolest highlights of northwestern Mallorca. Others noted that tour guides were both friendly and knolwedgable and made the day extra enjoyable. Great for first time visitors to the island. Ideal for families and friends. 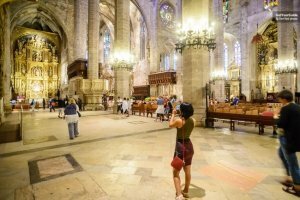 This tour provides an educational, informative and interesting guided tour of both the Palma Cathedral and the nearby Diocese Museum. The Palma Cathedral is also often called ‘La Seu’ and is home to the world’s largest rose window! Construction of the cathedral began in the 13th century and showcases a Levantine Gothic-style and took its inspiration from German cathedrals of that time. 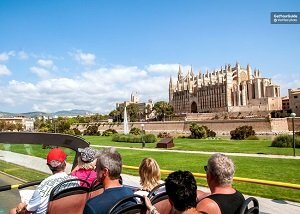 The tour starts with a visit to the famous and impressive Palma Cathedral where you’ll enjoy skip-the-line entry. Marvel at the buildings iconic décor and take a look at the rose window, it’s one of the largest rose windows in the world! Head to the Diocese Museum where you can explore religious artifacts and exhibits that are on display. Enterance to the Diocese Museum. The Mallorca Cathedral has earned over 10,627 reviews and a 4.5-star rating on Tripadvisor. Travellers noted that the cathedral was beautiful and boasts impressive stained glass windows. Others noted that the tour in general, including enterance to the Diocese Museum, was well worth it. A guided bike and culinary tour of Palma de Mallorca’s Old Town. 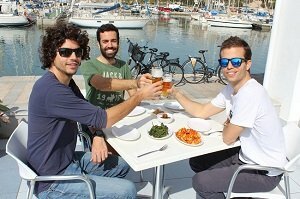 The Palma de Mallorca Old Town Guided Bike Tour and Tapas tour has earned over 204 reviews and a 4.5-star rating on Tripadvisor. Travellers noted that the ride was fun and gentle and offered a great way to explore the town. Others noted that the tapas restaurant was a highlight. Others noted that the tour guides were both friendly and knowledgable. An eight hour panoramic coastal tour discovering some of Mallorca’s best coastlines, beaches and mountain ranges by coach and on foot. Both the west and east coast of Mallorca is home to beautiful winding coastline, bustling artisan markets and seaside towns home to restaurants serving delicious Mediterranean and Spanish cuisine. This tour is great for those who’ve explored the ins and outs of Palme de Mallorca and looking to spread out and explore the surrounding countryside and coastline. Drive along Mallorca’s winding roads, taking in the scenic landscape as you go, and stopping to view the local sights, sample the local cuisine and take pictures of the rolling countryside. Enjoy a coach ride along one of Europe’s most scenic coastal roads found on the west coast of the island. Stop off at traditional markets for a spot of souvenir shopping and to soak up the relaxed Mediterranean environment. Full day tour with English and German speaking guide. The Discovering Mallorca: Panoramic Coastal Tour has earned 93 reviews and a 4.6-star rating on Get Your Guide. Great for those looking to explore the island. 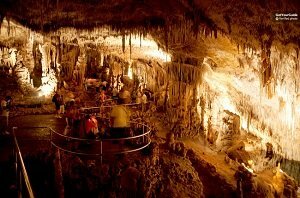 This is a five to eight hour tour that visits Mallorca’s famous Caves of Drach, located on the east coast of the island close to the small town of Porto Cristo. This tour is perfect for families, couples and friends alike who’ve explored the entirety of Palma de Mallorca and are ready for an adventure in the surrounding countryside and coast. The caves encompass four giant caves and were discovered around 1338 though have been around, it’s presumed, for far longer than that to around the Miocene Era. The day starts by hopping aboard a coach and taking the scenic drive over to Porto Cristo, located on the east coast of Mallorca. Here you’ll find the Caves of Drach where you’ll spend the morning exploring the impressive cave network and geological features including stalactites and stalagmites. 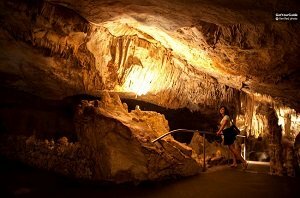 Follow your guide around the caves to learn about their history which spans back to the Miocene Era! Enterance to the Caves of Drach. Sightseeing tour in Porto Cristo. The Caves of Drach have earned over 8,693 reviews and a 4-star rating on Tripadvisor. Travellers noted that the caves were fascinating, beautiful and well worth a visit. Others noted that the east coast tour in general was well organised, enjoyable and provided a relaxing day. 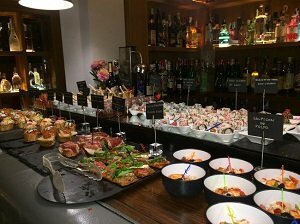 The Mallorca: Evening Culinary Tour Through Plama has earned 27 reviews and a 4.9-star rating on Get Your Guide. 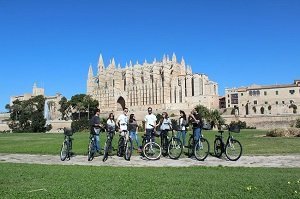 Travellers noted that the ride was fun and gentle and offered a great insight into Palma's history thanks to the informative guides. Others noted that the food samples were both ample and delicious. A five hour catamaran excursion along the coast of Mallorca, with lots of swimming, drinks and great food! The island of Mallorca is surrounded by the Mediterranean Sea which makes for a great spot for sailing. It’s an alternative day out and a different mode of transport that’s both adventurous and fun! You’ll be picked up by coach or car and transported down to Palma de Mallorca’s pier where you’ll meet your tour guide for the afternoon. Hop aboard the catamaran and set sail into the expansive blue Mediterranean Sea. Spend the afternoon sunbathing on the deck, jumping overboard to swim with the fishes or drinking in the shade of the lower deck. Bus transfer and nearby hotel pick-up. The Half-Day Catamaran Excurions has earned 245 reviews and a 5-star rating on Tripadvisor. Travellers noted that food onboard was delicious, the staff were professional and the boat was impressive. Others noted that the day out was great from start to finish and provided an alternative way to see Mallorca. A seven hour horseback excursion at Rancho Grande that includes a countryside hack, a barbecue feast and live music with line dancing. Rancho Grande is one of Mallorca’s most prominent riding schools and offers comprehensive lessons all year round for locals and tourists alike. Thanks to the beautiful countryside and landscapes on the island horse-riding is a popular and thrilling past-time. The tour beings with hotel pick-up and from here you’ll be transported to the tranquil Rancho Grande, one of Mallorca’s most prominent riding schools. Here you’ll be paired up with your horse for the day before embarking on a hack that takes you through some of the islands most picturesque landscapes. 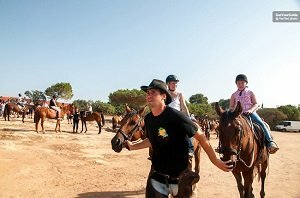 You’ll explore over 1,000,000 square metres of Northern Mallorca on horse back, enjoying the panoramic views as you go. Return transfers from your accomodation. English, Spanish and German speaking guide. BBQ meal, line dancing and free sangria . The Rancho Grande Park has earned 391 reviews and a 4.5-star rating on Tripadvisor. Travellers noted that the horses were well looked after, the staff were professional and the evening entertainment was great fun! Others noted that the day out is suitable for all ages. Perfect for couples or BBQ fans. 1 day scooter rental for 1 person. Helmet, lock and map of the island. 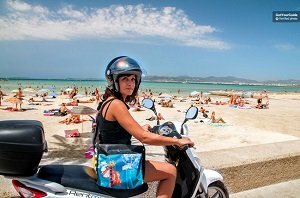 The Scooter Rental in Mallorca has earned 54 reviews and a 5-star rating on Tripadvisor. Travellers noted that the hire was affordable, easy and efficient. Others noted that the scooter allowed them access to some of the islands best secret beaches. Ideal for those who want to explore more of the island. A five hour catamaran cruise along some of Mallorca’s finest coastline. The south coast of Mallorca is renowned for its pristine beaches, turquoise waters and impressive caves which is why this tour is the perfect way to explore the shores just off the island. It’s an enriching experience suitable for friends, family and couples alike so long as you’ve got a love for the great outdoors and the ocean. Your day begins with hotel pick-up where you’ll be transported down to Palma de Mallorca’s pier and board the catamaran. Set sail out on the Mediterranean Sea with the wind in your hair, the sun on your face and a carefree attitude abound! The tour makes a stop at Cala Vella beach, a tranquil white sand beach, where you’re welcome to hop overboard and relax on the soft sands. 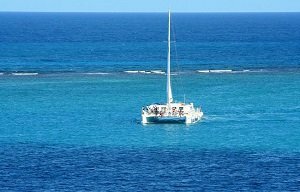 A 5 hour catamaran cruise with lunch or dinner. 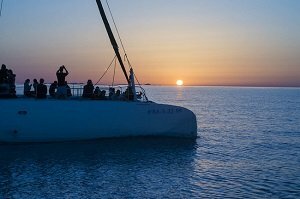 The Mallorca: Palma Bay Catamaran Cruise has earned 91 reviews and a 4.3-star rating on Get Your Guide. Travellers noted that the cruise was a wonderful way to spend the day and the buffet dinner was delicious. Others noted that paying €10 for snorkelling gear was well worth it!. Ideal for those who want to see the island from a different perspective. Great for lovers of the ocean. A half-day coasteering adventure that see’s you climbing along some of Mallorca’s best cliff faces and jumping into the tranquil Mediterranean Sea. This adventure filled excursion provides a thrilling day out in is a great way to burn some energy if you consider yourself and adventure seeker or an outdoor person. Coasteering is a physical activity that encompasses moving along rocky coastline and outcrops. The day will be spent abseiling down cliff faces, jumping off into the sea, exploring caves and scrambling across rocky terrain. The most exhilarating and adrenaline fueled part of the day will be the cliff jumping which sees you plunge of the side of a cliff into the sea below. Abseil down a rockface into the sea before climbing back onto the rocks and exploring the nearby caves. Spanish, German and English speaking guide. Safety equipment, harness and wetsuit. 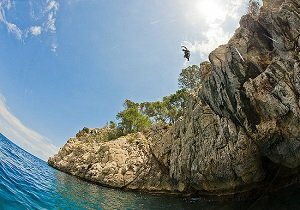 The Mallorca Half-Day Coasteering Tour has earned 250 reviews and a 5-star rating on Tripadvisor. Travellers noted that the experience was a real thrill and the professional guides quashed any nerves. Others noted that the transfers were speedy and well organised.